campo: marrying the old with the new. One of the most visible, though well-liked aspects of the inevitable march towards the corporatization of modern football is the ritual of clubs and countries providing their fans with new kits each and every season. Though a reliable revenue stream for both gear producers and clubs alike, it often pushes both to offer increasingly crazy — and often downright ugly — options in order to convince consumers it’s worth it to fork out for a new kit year after year. Undoubtedly, some fans really dig the wild and crazy designs. But there also remains a sizable contingent that want clubs to stick to their traditional looks and keep things simple. Likewise, many want their club to maintain an appearance that hearkens to their favorite memories of the team and their greatest achievements. They hold on to the hope that imitating how that side looked in their best moments might to help inspire similar results on the pitch. Perhaps it’s these types of feelings that can help to explain the recent spike in the popularity of retro football kits. The retro kit trend has not only seen clubs increasingly looking to their pasts for inspiration for their new kits, but it’s also one that’s seen a similar boom in the demand for re-creations of classic kits. After all, there are few ways better to pay homage to one of your side’s greatest moments than sporting the shirt they wore while writing that historic event. we remember much of football’s past in black and white. But in the realm of retro shirts itself, there are few ways to truly differentiate yourself from the competition. After all, you can only get so exact in your replication efforts. So the question becomes, how does one innovate when your goal is to emulate the past? Enter Campo Retro, a purveyor of retro replica apparel based in the UK. Campo offer an assortment of classic kits from British sides, all of stellar quality and near exact replicas of the famous shirts they’re meant to recreate. From the simple colored cottons of the 50’s and 60’s to the laminate polyester patterns of the 90’s, the attention to detail of Campo’s Score Draw line of official shirts and tracksuits are well worth the expenditures. But, in my humble opinion at least, it’s their Stadio line that deserve special attention. The Stadio collection of shirts are a complete re-imagining of the retro shirt. Unlike most throwbacks that look to recreate a team’s jersey for a specific season or memorable match, Campo Stadio shirts aim to provide a modernized spin on classic looks from various eras and styles of the game. 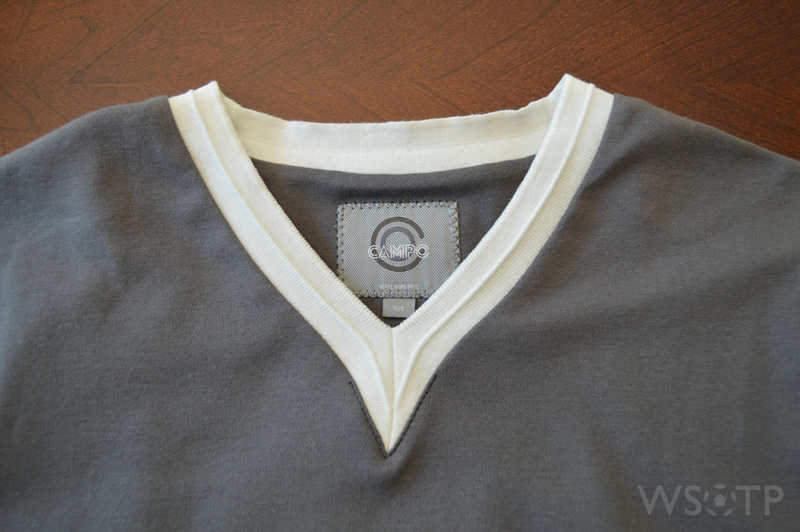 Take five different collar styles, apply one of a wide variety of basic templates free of logos or crests of any kind, and marry that all together with modern fit and construction techniques. Add that all up and you’ll find an extremely fresh take on the retro shirt. There are two basic flavors of the collection, the first of which is the Stadio Team Colors line. It features shirts in a wide array of vibrant team colors templates — hoops, sashes, solids, stripes, and bars — meaning you can likely find one to represent any club’s shirt. The second flavor is the Stadio No Team Colours line, which features most of those same attributes. Minus color. And it’s freaking brilliant. Picture a moment of football from the distant past — the early half of the century through the 70’s. Though we know those matches were kicked out in full color, the way we captured most of the early great moments of the beautiful game was in simple black and white. That’s what the Campo No Team Colours line looks to capture: the spirit that color isn’t needed to convey. And it does, with a modern twist. So when the good folks over at Campo shot me over an Azteca NTC shirt to review, you can imagine my elation. The shirt takes its design queues from Liverpool’s triumphant 1963/64 season plus historic Chelsea, Italy, Hungary, Yugoslavia and even Accrington Stanley shirts. I was immediately drawn to it’s clean, simplistic silhouette. A modern, slim fit coupled with a classic grey with an off white v-neck collar makes for a look that can be easily paired with denim to khaki and pants to shorts… if not a pair of all white match shorts, anyway. However, it was the little details on the shirt that really caught my eye. There’s the gorgeous hand zig-zag stitched, cotton number on the back, adding a truly vintage element to a shirt with a plethora of modern design queues. 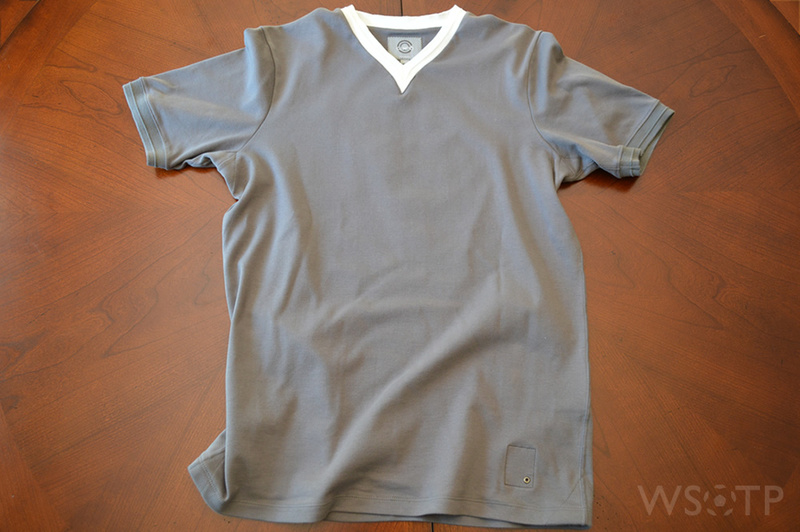 Triangular panels sewn into underarms provide the extra range of motion that many slim fitting shirts restrict. The raised ribbing on the collar and cuffs adds some much needed extra depth. And small accents, like the bottom brass rivet and QR code on the reverse or the Campo insignia on the sleeve, round out an overall gorgeous piece of clothing. The packaging the shirt came in, often an afterthought for most companies, was elegant in its own right. The reverse of the shirt. A small custom brass rivet gives hint of a QR code tag on the reverse. The embroidered Campo logo above the ribbed sleeve cuff. Extra panelling in the underarm helps to improve range of motion. The hand stitching on the basic number was a great retro touch. To be honest, I’d be half tempted to frame it and hang it up at WSOTP World HQ if I wasn’t so set on wearing it. For those curious about the fit of the shirt, the Medium/Large size was perfect for my 5’11” and 175 pound frame. I found the fit to be very similar to many other modern football jerseys, in particular this season’s home Spurs kit by UnderArmour: tighter around the upper torso, and a bit more lose as it approaches the waist. So if you’re in the market for a proper retro shirt, but don’t want to sacrifice style for that old-time look, a Stadio shirt from either the Team Colours or No Team Colours lines seem like a great ways of slipping on the best of both worlds. As Campo puts it, “every shirt tells a story”. And with a shirt from the Stadio collections, you’re free to decide the story it tells. Hi, yes this post is actually good and I have learned lot of things from it about blogging.